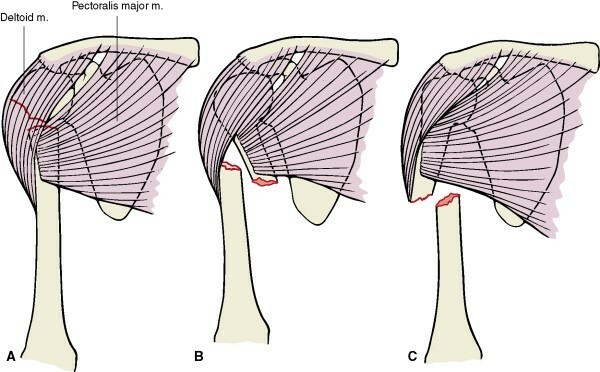 Fx distal to deltoid insertion: proximal fragment is abducted by deltoid, distal fragment shortens due to biceps and triceps contraction. 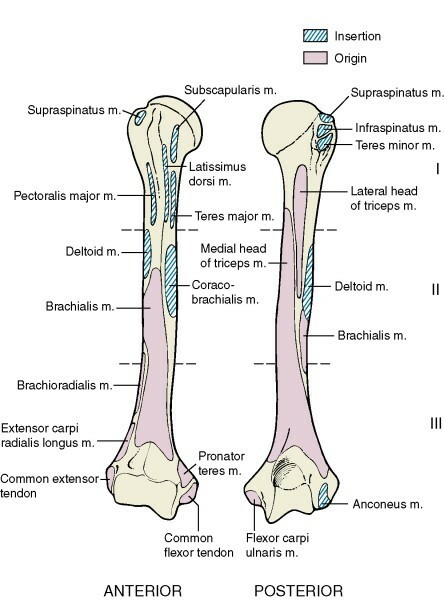 Holstein Lewis Fx: distal 1/3 of humerus, where radial nerve spirals posteriorly. High incidence of radial nerve palsy. Reduction: Rotational deformity, >30 degrees varus angulation or >2cm shortening. Discharge Planning: Ortho f/u w/in 1 week, pain control, immobilization. REASSURANCE. Courtney C. Nothing Humorous About This Fracture. Emergency Physician Monthly July 2015 Vol 22:7. http://epmonthly.com/article/nothing-humorous-about-this-fracture/ Accessed July 4, 2015.